By now, George Clooney is so smooth, he could be a brand name like Gillette or Ex-Lax. Occasionally fattened up for serious holiday fare like Syriana, he’ll always be first and foremost a perfectly coiffed variant of Danny Ocean; this critic’s favorite is his impossibly clever divorce lawyer in the Coens’ underrated Intolerable Cruelty. But how to bridge the two Clooneys, the suavely silly one and the soberly sincere one? 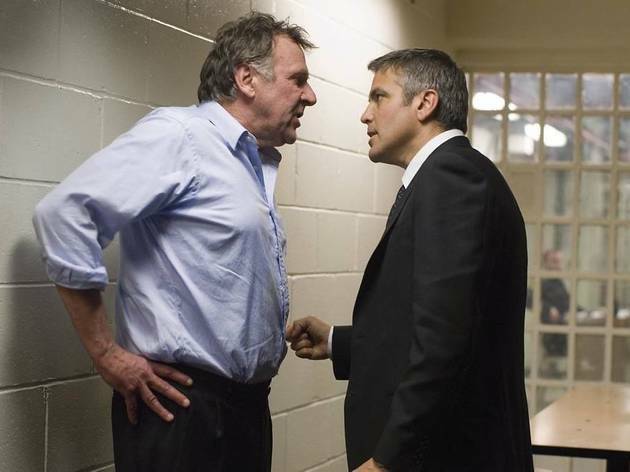 Michael Clayton, solemnly titled in the manner of great ’70s crusader movies like Norma Rae and Serpico, takes a perfectly feasible stab at it. 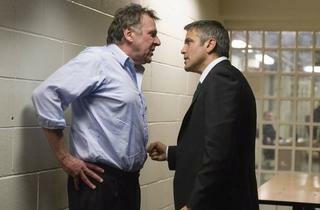 Again, it’s Clooney as cool customer, private card shark and lapsed attorney. But you can tell by the way he desperately lunges for his small son’s attentions as the kid bounds out of the passenger seat that this guy’s got deeper issues. They stem from working freelance for legal weasels like Marty (Pollack) and Arthur (a superbly unraveling Wilkinson), both in a firm about to come under heavy fire for abetting some serious corporate malfeasance. Yes, the film becomes one of those, with Clayton radicalizing—actually, waking is more apt—into an insistent rooter of crime. Debuting director Tony Gilroy, best known as the key writer behind the Bourne movies, loves the mile-a-minute browbeating of business types; often, this feels like a more heroic version of Glengarry Glen Ross. “You know exactly what you are,” hisses Clayton’s detective brother cryptically. The beauty of this rich, wrinkly movie—which ends on an unbroken close-up, the peak of Clooney’s art—is that we never completely do.